Step 1 Add olive oil, onions, bell pepper, and garlic. Sauté for 8 minutes. Heat a heavy pot, and toast quinoa for 3 minutes, stirring frequently. Step 2 Stir in flour, then add broth and plant-based milk, stirring well. Add olive oil, onions, bell pepper, and garlic. Sauté for 8 minutes. Step 3 Add corn, beans, parsley, thyme, pepper, and salt (optional). Stir until well-combined. Stir in flour, then add broth and plant-based milk, stirring well. 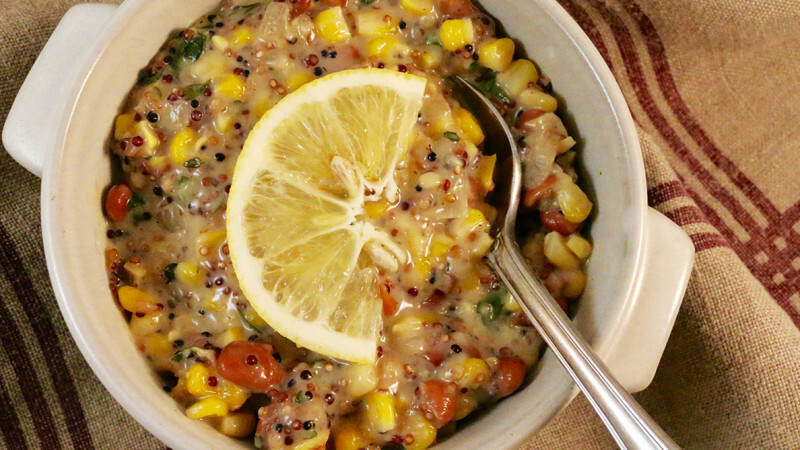 Step 4 Heat chowder, while stirring frequently, until bubbly, thickened, and quinoa is tender—about 10-15 minutes. Add corn, beans, parsley, thyme, pepper, and salt (optional). Stir until well-combined. Step 5 Heat chowder, while stirring frequently, until bubbly, thickened, and quinoa is tender—about 10-15 minutes. This vitamin- and protein-packed soup makes meal prep a breeze. Nutrient-packed soup is the answer to painless meal prep. The star nutrients in this lightened-up chowder are vitamins Opens a New Window. A, C, and K, folate, magnesium, phosphorus, and manganese. If you’re looking to up the 11g of protein, you can add shredded chicken Opens a New Window. , too.